You are now leaving BioCellCollagen.com and being directed to a third party website which markets an authentic finished consumer packaged product made with BioCell Collagen licensed by BioCell Technology. BioCell Technology has no control over, and accepts no responsibility for, the content of the following website. 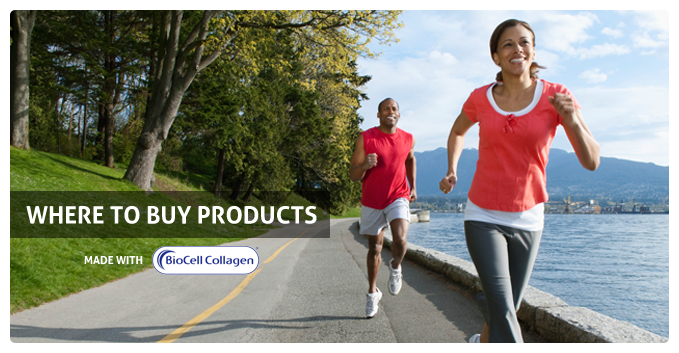 BioCell Technology is not liable for products and services advertised on any third party websites. ULTRA WOMAN™ Collagen Support is a specialized formula designed to support healthy aging and overall health and wellness. Beneficial nutrients are formulated into a synergistic complex to support your beauty from within. The formula is designed with 1 gram per serving of BioCell Collagen II®. Biocell provides components naturally found within healthy skin including Hyaluronic Acid. Collagen is the glue that holds the body together. It connects and supports our skin, bone, tendons, muscles, and cartilage. Collagen plays a particular important role in the maintenance of healthy joints. It is a building block of joint cartilage and the structural protein found in joints. But as we age, the quality and quantity of collagen in our bodies tends to deteriorate, which can effect the function of joints. Collagen Type II with Hyaluronic Acid contains a patented, 100% pure Type II Collagen extracted from chicken cartilage. Though there are over 14 difference types of collagen, only Type II collagen has been shown effective in clinical research. The collagen in this formula, along with naturally occurring levels of hyaluronic acid and chondroitin sulfate, helps to promote joint health. Hydraplenish™ contains the patented BioCell Collagen complex for healthy connective tissue and synovial fluid. Hydraplenish has superior bioavailability and a lower molecular weight than other sources of hyaluronic acid. Hyaluronic acid is a "gelatin-like" fluid that acts as a natural lubricant and shock absorbent within the body. It's an important part of healthy connective tissue, and is also abundant in the eyes, joints, heart valves and skin. A patented complex designed to support and increase the collagen production of your skin. Collagen is the most integral part of the skin’s fabric, giving your skin and your complexion the elasticity and glow of youth. Collagen, a mesh-like structure is the most abundant protein found in the skin. It naturally forms a system to support the skin as well as encourage new cellular growth. As we age our production of collagen declines and the internal supportive mesh weakens, leaving our skin flaccid and lackluster. COLLAGEN BOOSTER ensures that your skin has the best chance to restore itself so that it looks radiant and is soft and silky to the touch. Ultimate H.A. Formula® feautures BioCell Collagen and offers the amazing joint supporting benefits of Hyaluronic Acid along with powerful antioxidants in one revolutionary formula. by Health Logics Laboratories, Inc. Since its breakthrough discovery in 1997 millions of consumers have safely enjoyed the benefits of BioCell Collagen. Its holistic and natural approach to maintaining healthy connective tissue, joint and skin is unmatched by any other product on the market. More than 20 clinical studies support the safety, bioavailability and effectiveness of BioCell Collagen and its constituents. Hyaluronic acid and collagen are vital components of skin structure that decline as we age. They are responsible for the skin's moisture, suppleness, and elasticity. Patented BioCell Collagen II™ is made from 100% pure cartilage, which has undergone an absorption enhancing hydrolyzation process that yields low molecular weight hyaluronic acid, chondroitin sulfate, and Collagen Type II peptides. These elements found in BioCell Collagen II make it a multifaceted ingredient which may help support healthy skin function and appearance, as well as help support joint comfort and function.